Wilson College maintains a collection of antiquities, supervised by faculty in the classics discipline, dating from the third millennium B.C. to the Byzantine period. The collection includes items from Egypt, Mesopotamia, Italy, Greece, Palestine and Syria. 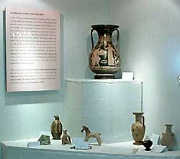 The greatest concentration of items in the collection are of Greek and Roman origin. Included are ceramics, glassware, coins, metal objects of various types, terra-cotta figurines and sculpture. These objects play an important role in the study and interpretation of the ancient world in the classroom. The Barron Blewett Hunnicutt Classics Gallery was named in memory of Barron Blewett Hunnicutt, lecturer in fine arts at Wilson College in the 1980s, in recognition of her dedication and commitment to the classics, and her love of the liberal arts and of Wilson College. 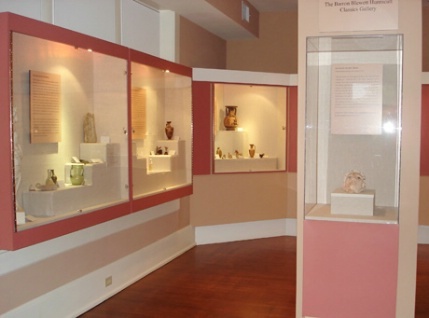 The Gallery displays exhibits featuring the College's collection of antiquities. The artifacts in the collection were acquired by purchase and donation from alumnae, students, faculty and friends of the College. Explore the online exhibit featuring a small number of pieces from the collection currently on view at the Hankey Center at Wilson College here. For further information about the Gallery and about the collection, please contact Professor Bob Dickson at 717-264-4141, ext. 3400.